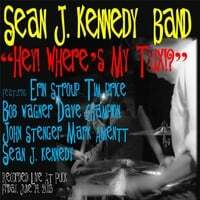 The Sean J. Kennedy Band is a drummer led greasy-groovin' horn band. Reviews... The Philadelphia Inquirer: "...intense and sometimes far-out live performances…” Dave Brubeck: "Your drumming sounds like it should - it swings!" Sean J. Kennedy pulled his car into the lot of Puck Live in Doylestown on June 14, 2013, popped open the hatch and started unloading his drums onto the steamy sidewalk, as six of his closest musician friends made their way to meet him at the venue for the night’s gig. Carrying heavy loads of instruments inside, the guys welcomed the cool, damp air of the subterranean room, as they made their way through the maze of tables to the dimly lit stage, and set up for the show. Often times, playing jazz means running through standards at weddings or special events, so the fact that this gig featured the band as the main attraction, and called for an audience that was focused on seeing, hearing and dancing to the craftsmanship of musicians brimming with eagerness to play their own music, added an unmistakable element of excitement. A diverse crowd accumulated as people, one by one, strolled past the droning, mechanical thumping that was emanating from the DJ’s techno-music turntable on the patio behind the building. Unbeknownst to the clubbers above, it was down below the ground where the fun was taking place. Joining Kennedy on stage for this performance were virtuoso musicians and longtime friends, Erin Stroup (saxophone), Tim Price (saxophone), Mark Amentt (bass), John Stenger (keys), Bob Wagner (trumpet) and Dave Champion (trombone); with engines revving, all drivers were ready to take off when the first tune was called, and the ride was nonstop energy from the first note until the last. Song after song, the hard-driven tempo kept pace, and the passionately expressed melodies moved the listeners so much that people got up, pushed the tables aside and started dancing. They moved to the new Kennedy original, What Was That?, a driving tune with killer trombone and keyboard solos, which was inspired by a lonely walk through a dark, empty parking garage. Turning up the tempo, the band jammed to another new original, Hey! Where’s My Tux? This fast-paced homage to cartoon music-man, Hoyt Curtain, is written about a fictitious superhero whose Achilles Heel is the tux that he needs to wear to fight crime, but which always ends up missing when duty calls. The tune was a crowd-pleasing success, particularly when the horns belted out quotes from popular Curtain’s cartoon theme songs. Next, the guys kept the crowd kicking their feet with a New Orleans standard, by Ted Snyder, called the Sheik of Araby, and then slowed it down for the swaying lovebirds in the audience with Amentt’s sweet but funky tune, Jilly Bean, a beautiful song written for his wife, Jill. The raucous new Kennedy blues tune, NG2, got things moving a little faster after that. In the style of Louis Prima, this song is about Kennedy’s 2-year-old daughter, Natalie Grace, and the solo sections, because of her name, are based on the tune, Amazing Grace; after that, the band grooved through a new version of their longtime, crowd-pleasing staple, Sweetie Pie, a happy, upbeat New Orleans 2nd Line blues which was written by Stroup for his daughter, Logan. Henry Mancini was the musical inspiration for the next Kennedy original, Long Track, Short Legs, which was written about Kennedy’s small children running in a track meet, and its fast tempo had everyone in the room hopping before the band brought down the house with the incredibly funky and danceable, new Amentt original, Funk Station. The audience was still on their feet, ready for another tune when it was all over, and the forceful energy never died down until the room was empty again. What happens when a wide array of skilled musicians with different experiences and backgrounds come together to make music, to “sing” their songs and tell their stories through their instruments is immeasurable and indescribable, but fortunately for everyone, it is not elusive – the magic of the fun, swinging energy that Sean and friends let loose in their jazz originals, painted with elements of rock, blues and funk, was captured that memorable night in this old-style gem of a recording, intended to keep listeners feeling and grooving to the music for a long, long time.